Lucius Sempronius Atratinus was a Roman politician who was elected suffect consul in 34 BC. 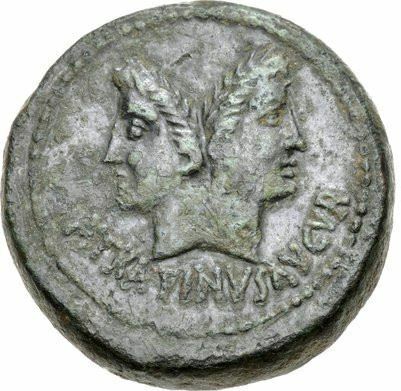 He struck coins c. 39 BC as Augur and jointly with Marcus Antonius. In 56 BC he launched a prosecution against Marcus Caelius Rufus who had previously unsuccessfully attempted to prosecute Atratinus’s adopted father on bribery charges. Caelius had fallen out with his lover, Clodia, and she accused him of attempted poisoning. Other charges included the murder of an ambassador. She asked Atratinus to prosecute Caelius, which he was only too happy to do. Caelius was successfully defended by Marcus Tullius Cicero, and in his published Pro Caelio, Cicero claimed that Atratinus was being manipulated by Clodia to get revenge on Caelius for an affair gone wrong. At some point prior to the Battle of Actium, Atratinus abandoned Antony and switched his support to Octavianus. He was made proconsular governor of Africa around 23 BC, and was awarded a triumph for his actions there in 21 BC.